GCA has advised business intelligence and media company Uzabase Inc. (TSE: 3966) on its acquisition of a 100% stake in Quartz Media LLC., a global business news platform. Tokyo-based Uzabase provides business news and intelligence platforms to support its corporate customers’ business decisions. The company operates SPEEDA, a comprehensive financial business-intelligence service and NewsPicks, a subscription economic and business news platform. Quartz, founded by the Atlantic Media Group in 2012 and based in New York, is an award-winning, digitally native business news outlet. Led by a team of experienced journalism and technology professionals, Quartz has earned high acclaim as a premier digital media brand that successfully combines innovative mobile technology offerings – such as apps, bots, messaging, and charts – with best-in-class news reporting. 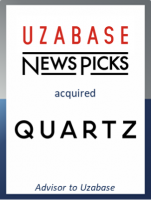 The acquisition is expected to create a larger, robust global business news brand that combines Quartz’s international reach and its voice, editorial, advertising and product expertise with Uzabase’s deep expertise in data and niche paid content. GCA acted as exclusive financial advisor to Uzabase in connection with this transaction.